Earlier this week, we caught a glimpse of some graffiti-riddled low top kicks from Vetements’s Fall/Winter 2018 collection, however, now turn our attention to yet another scribble-adorned item also under Demna Gvasalia’s creative direction, this time from the Balenciaga umbrella. Part of the high-end house’s FW18 lineup, this black leather fanny pack, too, spotlights decorative tags in soft pastel shades of blue, yellow and pink. Artistic details include such words as, “Couture,” “Bag,” and “Paris,” as well as a version of its logo. The waist bag features two front-facing zipper compartments, along with a nylon strap hook closure. 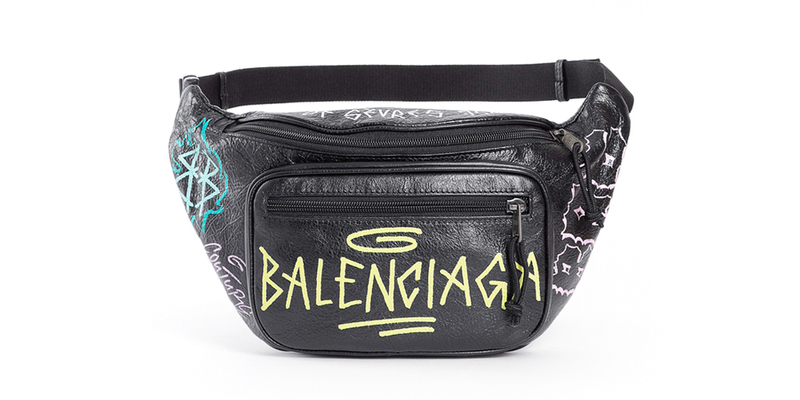 Set to a price of $11,600 HKD (approximately $1,478 USD), you can find this Balenciaga fanny pack now at such retailers as Antonioli. In keeping with statement accessories, Gucci dropped two bold tote bags from its Pre-Fall 2018 collection. Confirmed by Chance himself in a new interview. Take a Better Look at the Nike Air VaporMax Flyknit Utility "Black/Volt"
A bold take on the rugged running model. U.S.-based online shoppers could be affected. Vocal guests include Nicki Minaj, James Fauntelroy, PARTYNEXTDOOR, Future, Paul Anka and more. Featuring production from SOPHIE, David Wrench and Faris Badwan.